FDA的药物评价和研究中心肿瘤药品办公室主任Richard Pazdur, M.D.说“"对有后期黑色素瘤患者今年是重要一年。Zelboraf是证实改善总生存的第二个被批准新抗癌药物” “3月我们批准了Yervoy (ipilimumab)，为后期黑色素瘤另一个新治疗，接受药物后也显示延长患者生存。” FDA的设备和放射健康部中的在体外诊断设备评价和安全性办公室主任Alberto Gutierrez, Ph.D说：“今天批准的Zelboraf和cobas检验是发展伴随诊断和使用以保证患者以安全方式被暴露至高度有效，更个体化治疗一个大实例。” 批准日期：2011年8月17日；公司：Plexxikon Inc. HOFFMAN-LA ROCHE ZELBORAF™ (vemurafenib)口服片 美国初始批准：2011 适应证和用途 ZELBORAF™是一种激酶抑制剂适用于有不可切除或转移黑色素瘤有用FDA-批准的检验检测BRAFV600E突变患者的治疗。 使用限制：有野生型BRAF黑色素瘤患者中建议不使用ZELBORAF。 剂量和给药方法 （1）推荐剂量：960 mg口服bid。 （2）接近12小时间隔给予ZELBORAF有或无进餐。 （3）应用一杯水完整吞服ZELBORAF。不应咀嚼或压碎ZELBORAF。 （4）症状性不良药物反应的处理可能需要减低剂量，中断治疗，或终止ZELBORAF治疗。不建议减低剂量导致剂量低于480 mg。 剂型和规格 膜衣片：240 mg 禁忌证 无 警告和注意事项 （1）24%患者中发生皮肤鳞状细胞癌(cuSCC)。治疗开始前和当用治疗时每2个月进行皮肤学评价。切除处理和继续治疗不调整剂量。 （2）治疗期间和再次开始治疗时曾报道严重超敏反应，包括过敏反应。经受严重超敏反应患者中终止ZELBORAF。 （3）曾报道严重皮肤学反应，包括Stevens-Johnson综合征和中毒性表皮坏死溶解。经受严重皮肤学反应患者中终止治疗。 （4）曾报道QT延长。治疗前和调整剂量后监视ECG和电解质。在第15天，治疗头3个月期间每3个月，其后每3个月，或更常如临床指示时监视ECGs。如QTc超过500 ms，短暂中断ZELBORAF，校正电解质异常，和控制对QT延长风险因子。 （5）可能发生肝实验室异常。治疗开始前和治疗期间每月，或当临床指示时监视肝酶和胆红素。 （6）曾报道光敏性。服用ZELBORAF时建议患者避免暴露阳光。 （7）曾报道严重眼科反应，包括葡萄膜炎，虹膜炎和视网膜静脉阻塞。对眼科反应常规监视患者。 （8）曾报道新原发性恶性黑色素瘤。切除处理，和继续治疗无剂量调整。如上所述，进行皮肤学监视。 （9）妊娠：可能致胎儿危害. 忠告妇女对胎儿潜在风险. （10）为了选择适于ZELBORAF治疗患者，用一种FDA-批准的检验BRAF突变。尚未在有野生型BRAF黑色素瘤患者中研究ZELBORAF的疗效和安全性。 不良反应 最常见不良反应(≥ 30%)是关节痛，皮疹，脱发，疲乏，光敏反应，恶心，瘙痒和皮肤乳头状瘤。 为报告怀疑不良反应，联系Genentech电话1-888-835-2555或FDA电话1-800-FDA-1088或www.fda.gov/medwatch. 药物相互作用 （1）CYP底物：建议不要的同时使用ZELBORAF与被CYP3A4，CYP1A2或CYP2D6代谢治疗窗狭窄药物。如不能避免共同给药，谨慎对待和考虑减低同时CYP1A2或CYP2D6底物药物的剂量。 （2）ZELBORAF可能增加同时给药华法林[warfarin]暴露。当ZELBORAF与华法林同时使用时谨慎对待和考虑另外INR监视。 特殊人群中使用 （1）哺乳母亲：当接受ZELBORAF时终止哺乳 如何供应/贮存和处置 ZELBORAF(vemurafenib)以240 mg膜衣片供应一侧凹有VEM，在单个瓶中120片。以下是可得到的包装： 贮存和稳定性：贮存在室温20°C - 25°C (68°F - 77°F)；外出时允许15°C和30°C间(59°F和86°F), 见USP控制室温。贮存在原始包装，盖密封。 Active Ingredient(s): Vemurafenib 240mg; tabs. Indication(s): Treatment of unresectable or metastatic melanoma with BRAFV600E mutation as detected by an FDA-approved test. Pharmacology: Vemurafenib is a low molecular weight inhibitor of some mutated forms of BRAF serine-threonine kinase, including BRAFV600E. Vem-urafenib also inhibits other kinases in vitro such as CRAF, ARAF, wild-type BRAF, SRMS, ACK1, MAP4K5 and FGR at similar concentrations. Some mutations in the BRAF gene including V600E result in constitutively activated BRAF proteins, which can cause cell proliferation in the absence of growth factors that would normally be required for proliferation. Vemurafenib has anti-tumor effects in cellular and animal models of melanomas with mutated BRAFV600E. 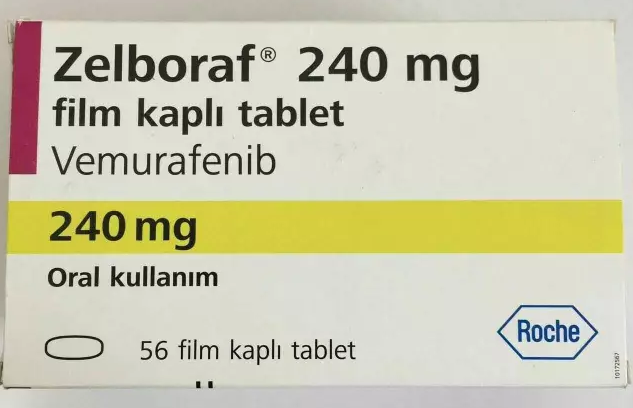 Clinical Trials: The efficacy and safety of vemurafenib in patients with treatment naive, BRAFV600E mutation-positive unresectable or metastatic melanoma as detected by the cobas 4800 BRAF V600 Mutation Test were assessed in an international, randomized trial. This trial involved 675 patients who were given either vemurafenib 960mg by mouth twice daily or dacarbazine 1000mg/m2 IV on Day 1 every 3 weeks. The major efficacy outcome measures were overall survival (OS) and investigator-assessed progression-free survival (PFS). Other outcome measures included confirmed investigator-assessed best overall response rate. The median survival of patients who received vemurafenib has not been reached (77% still living) while the median survival for those who received dacarbazine was 7.9 months (64% still living). The median PFS for vemurafenib was 5.3 months compared to 1.6 months for dacarbazine. The overall response rate in the vemurafenib arm was 48.4% (95% CI: 41.6%, 55.2%) compared to 5.5% (95% CI: 2.8%, 9.3%) in the dacarbazine arm. Legal Classification: Rx Adults: Swallow whole with water. Take in the AM and PM (approx. 12 hours apart). ≥18 years: 960mg twice daily; until disease progression or unac-ceptable toxicity occurs. Dose modifications for adverse reactions or QTc prolongation: see literature. Dose reductions <480mg twice daily: not recommended. Children: <18 years: not recommended. Warnings/Precautions: Not for use in wild-type BRAF melanoma. Confirm BRAFV600E mutation-positive melanoma with FDA-approved test before treating. Risk of cutaneous squamous cell carcinoma (cuSCC): ≥65 years, prior skin cancer, chronic sun exposure; if occurs, do excision and continue without dose adjustment. Do dermatologic evaluation before therapy, every 2 months during, and consider monitoring 6 months after. Long QT syndrome or QTc >500ms, uncorrectable electrolyte abnormalities, or concomitant drugs that prolong the QT interval: not recommended. Monitor electrolytes before therapy and after dose adjustments. Monitor ECG at Day 15 of treatment, monthly during the 1st 3 months, then every 3 months thereafter, or more as needed. If QTc >500ms, interrupt therapy, correct electrolytes, and control cardiac risk factors. Severe hepatic or renal impairment. Monitor liver enzymes, bilirubin before therapy and monthly, or as needed. Monitor for ophthalmologic reactions routinely. Avoid sun exposure. Pregnancy (Cat. D); avoid. Use adequate contraception during therapy and for at least 2 months after. Nursing mothers: not recommended. Interaction(s): Concomitant CYP3A4, CYP1A2 or CYP2D6 substrates with narrow therapeutic indices: not recommended; if CYP1A2 or CYP2D6 substrates unavoidable, consider dose reduction of substrates. Caution with concomitant strong CYP3A4 inhibitors (eg, azole antifungals, clarith-romycin) or inducers (eg, phenytoin, rifampin). May potentiate warfarin; monitor INR. Adverse Reaction(s): Arthralgia, rash, alopecia, fatigue, photosensitivity, nausea, pruritus, skin papilloma; cuSCC, severe hypersensitivity or dermatologic reactions (discontinue if occurs), prolonged QTc, uveitis.